Welcome My Crafty Friends so glad you have stopped by. Today my post is a card I created using Susan’s Garden Notes Lilies 2 die set. I had seen a picture of pink lilies and they were so pretty I had to try to create in paper. Here is my inspiration hope I did it justice.. Step 1 From brown cardstock cut 4 Garden Notes Berry Branch 2 with Clear Double Sided Adhesive on back adhere to 2 without adhesive. Using Distress Ink shade branches. Use Nuvo Crystal Drops – Autumn Red to add berries then set aside to dry once dry add berries to back side again set aside to dry. Step 3 Pick background for card it should be 4-3/4″ X 6-3/4″ what was used here was piece that was done with Distress Inks. Step 4 Cut 85# white Soft Finish Cardstock 5″ X 7″. Using Garden Notes Frame It – Rectangles -next to the largest die cut frame in cardstock placing it so there is an even frame on sides and top leaving wider area at bottom. Step 5 adhere frame over background paper using Clear Double Sided Adhesive. Adhere frame to card front using Clear Double Sided Adhesive. Step 6 Cut 2 Garden Notes Trevi Urns from clear cardstock which has Clear Double Sided Adhesive on back. Using blue alcohol marker color front of one to make it look like water. Adhere other urn over colored one. Remove release sheet from back add couple of dimensional dots to center back of urn then adhere to card inside frame. NOTE: leave urn top opening free of adhesive so to put stems down into urn. Step 7 Die cut 7 Garden Notes Lilies 2 from 100# white Soft Finish Cardstock. Color using alcohol markers – Copics RV02, RV04 and Y15 used here. Cut leaves from green cardstock shade with Distress ink.. Using Garden Notes All Steel 4 pc. Tool Kit, Molding Pad, Leaf Pad shape petals and leaves use Kids Choice Glue to assemble. Step 8 Die cut Garden Notes Ladder Ferns 3 times. Shade with Distress Ink using tweezers to hold pinch up fronds with fingers to give dimension. Step 9 Assemble bouquet on card using Kids Choice Glue. Step 10 From black glitter cardstock with Clear Double Sided Adhesive on back cut Hugs 3 times using Suzanne Cannon’s A Way With Words – Sending Hugs Kisses die set stack 3 together adhere to lower card front. I do hope you have enjoyed my tutorial today and it has inspired you to create! 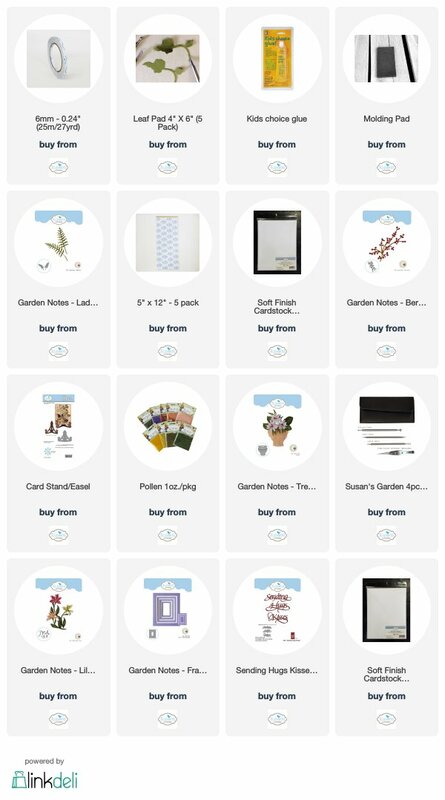 Product list below of items used to create card by clicking on any of the Elizabeth Craft Designs items it will take you directly to their site. Thanks for stopping by my blog today and until next time …..